BPI Alternative is a long short equity fund investing in listed Portuguese and Spanish equities, or equity related assets. BPI Brasil is a long only Fund investing in listed Brazilian equities and fixed income. The Fund aims to provide the investor with direct access to a market with high growth potential and to offer a sustainable return over a reasonable time frame through an active management approach. BPI Alternative is a long short equity fund that invests in listed Portuguese and Spanish equities, or equity related assets. BPI Iberia invests in listed Portuguese and Spanish equities or equity related assets which offer upside potential. The fund aims to beat the benchmark* over a reasonable time frame through an active management approach. BPI Africa is an Equity UCIT III fund that invests in companies with significant operations located in Africa, without any country or sector restrictions. The fund aims to provide the investor with direct access to markets with high growth potential and that are not directly reachable to most of them, in the African continent. BPI Brasil is a long only Fund investing in listed Brazilian equities and fixed income. The Fund aims to provide the investor with direct access to a market with high growth potential and to offer a sustainable return over a reasonable time frame through an active management approach. BPI Iberia invests in listed Portuguese and Spanish equities or equity related assets which offer upside potential. The fund aims to beat the benchmark over a reasonable time frame through an active management approach. BPI Alternative Fund is a long/short equity fund investing in listed Portuguese and Spanish equities or equity related assets. The main concerns are to keep a low volatility, reduced drawdown and a low correlation with equity markets. 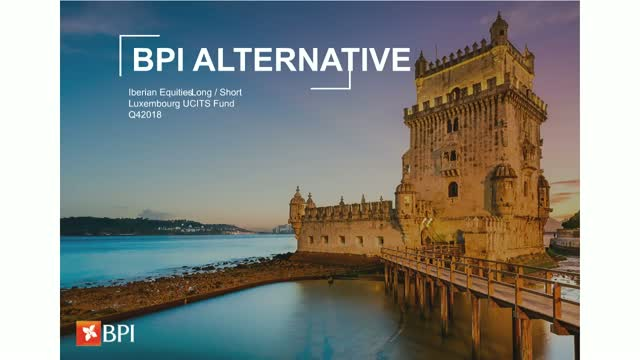 Live quarterly webcasts about funds, managed by BPI Gestão de Activos, particularly about Iberian equity strategies and African equity strategies.